The SKB ATA Guitar Case is the first Injection molded guitar case. 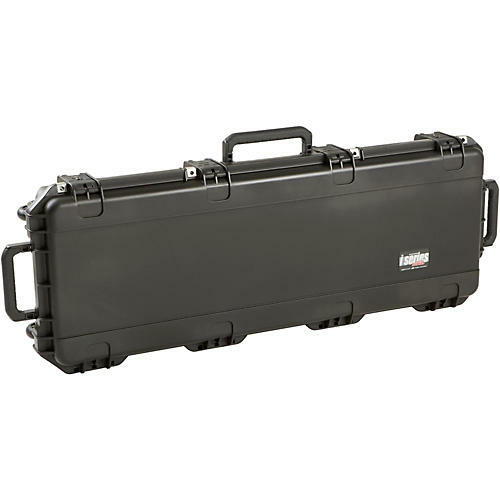 It accommodates all guitar models and is the latest member of SKB's 3i series of waterproof cases. 3i Series injection molded waterproof cases are constructed of ultra high-strength polypropylene copolymer resin and feature a gasketed, waterproof and airtight, submersible design that is resistant to corrosion and impact damage. Its continuous molded-in hinge, patented "trigger release" latch system with TSA recognized and accepted locks, four reinforced locking loops for customer supplied locks,comfortable, snap-down rubber over-molded cushion grip handles, secure stacking, and automatic ambient pressure equalization valve all contribute to its military grade design.